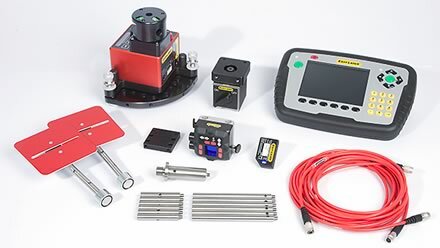 The Easy-Laser® product range includes systems for Shaft Alignment, Sheave/Pulley Alignment, Geometrical Measurement and Vibration Measurement. With Easy-Laser® Alignment systems you help reduce wear and tear on for example couplings, sealings and bearings. You also minimize energy consumption, reduce vibration and noise. All together resulting in substantial savings thanks to lower maintenance and operating costs. This means that the investment in an Easy-Laser® Measurement and Alignment system usually pays off in less than a year. Sometimes already after a couple of months! With Easy-Laser® Geometrical systems you measure and align machine tools and machine constructions to secure highest manufacturing quality on parts and reduce wear on tools. This too of course means big figures savings. The new Easy-Laser® E710 is an alignment system with functions for all the important stages of machine setup. It gives your machines the right conditions for optimal reliability and long service life. The measuring system has functions that are not offered by any other system on the market! 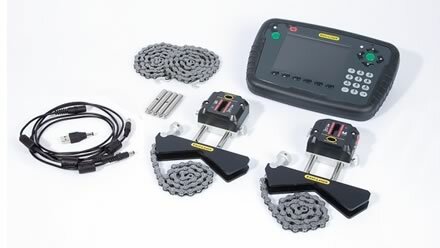 Easy-Laser� E540 is a very powerful shaft alignment system, with the ideal balance between performance and price. Program that guides step-by-step with both icons and text makes the system very easy to use for everyone, regardless of prior knowledge. 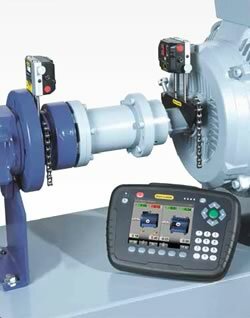 The E540 system includes measurement programs for horizontal machines, vertical machines and alignment of machine trains with three machines. The measuring units are pre-mounted for rapid machine set-up. Start with the measuring units positioned anywhere through 360 � around the shaft, then take any three readings down to 20� in-between. Then adjust the machine with the live-values in both horizontal and vertical directions. A PDF report is generated automatically when the measurements are saved. Simple and efficient! This system can be used to carry out all the most common geometric measurements; straightness, flatness, squareness, plumb and level. Measurement is quick and precise. Displayed resolution is 0.001 mm [0.05 mils]. The laser transmitter is our well known big seller, the D22 with levelling table, strong magnetic feet, and a range of up to 40 m. The transmitter's laser beam can be compared to an absolutely straight and weightless ruler, that is to say a perfect starting point for precision measurement. The swivelling laser head gives a laser plane parallel to the measured object and can also angle the laser beam 90� to the sweep for squareness measurement. The Easy-Laser� E420 sets a new standard in entry level laser systems for shaft alignment. Wireless measuring units, a large 5.7� colour display and an IP65-rated design that withstands harsh environments. These are the features you would normally only find in more expensive systems! The measuring units are incredibly compact featuring Bluetooth� Wireless technology, an integrated rechargeable battery and large 20 mm TruePSD detectors. This means that they are easy to install on most types of machines, even where there is limited space. The wireless technology gives you full freedom of movement around the machine that is to be aligned. 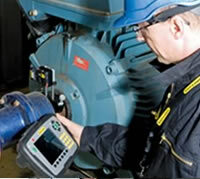 Programs for alignment of both horizontal and vertical machines are included. Added to that are functions for soft foot control, thermal growth compensation and tolerance control. The measurement system is very easy to use. Pre-mounted units make it easy to install on the machine and the programs guide you step-by-step through the process. Start with the measuring units positioned anywhere on the shaft, recording three readings with as little as 20� of rotation between readings. Then adjust the machine with the live values, and save the measurements in the display unit memory. You can also transfer the results to the database EasyLink � program (included) for PC. Easy-Laser� E420 has everything an entry level system should have, and more. 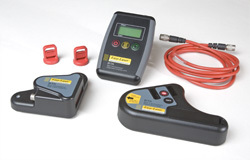 Simply put, Easy-Laser� sets a new standard for measuring solutions. See the result as a true 3D image in the display unit directly after measuring. Then evaluate the result easily with different calculation settings, for example three point reference, best fit or all positive. This can also be done directly on site without having to stop to go to a PC with separate analysis programs, which was the case previously. This makes production much more efficient. 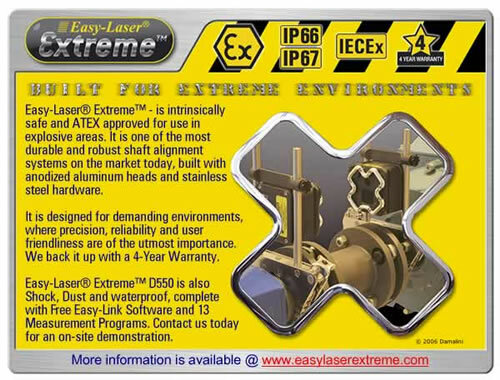 Easy-Laser® E530 is a very powerful shaft alignment system, with the ideal balance between performance and price. Program that guides step-by-step with both icons and text makes the system very easy to use for everyone, regardless of prior knowledge. The measuring units are pre-mounted for rapid machine set-up. With the barcode reader the user can save many key operations where all machine dimensions, tolerances and compensation values are entered in one single operation*, and the measurement can be started directly. Start with the measuring units positioned anywhere through 360 ° around the shaft, then take any three readings down to 20° in-between. Then adjust the machine with the live-values in both horizontal and vertical directions. A PDF report is generated automatically when the measurements are saved. Simple and efficient! Easy-Laser® D160 is attached in a few seconds (magnets) with the laser transmitter on one of the sheaves and the detector on the other. The separate display unit makes it all even easier, as you can read off and follow the adjustment at the precise point on the machine where the adjustment is made. The transmitter generates a laser plane parallel to the reference sheave. The detector reads the position in relation to the laser plane and provides a live digital display of both offset and angular value. This makes the alignment of the adjustable machine very simple. The display is also backlit for optimum visibility in poor lighting conditions. The accuracy of the digital readout means that you can align within prescribed tolerances and rely on the result. 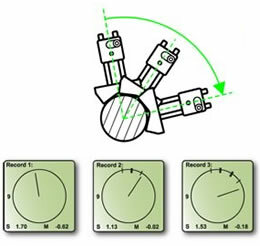 With the EasyTurn program only 40° is needed for a complete measurement. The program guides you to the correct position.